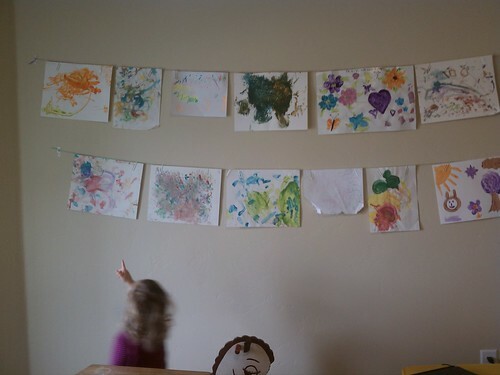 Lily has been painting pictures since she was a year old, but I’ve only ever had one or two displayed and rarely if ever change them out. I have been looking for some way to display more of her pictures, but hadn’t found anything that I just loved and was within my skill level. Finally I realized that I could take a piece of what I saw here and there and make it mine. I had this very large blank wall in our Family Room that I needed to do something with and inspiration hit me over the head. We stopped at Lowe’s and grabbed some 3m Command hooks (love those things) and some lovely colored twine and got to work. Thankfully Waldo had the brains enough to use a tape measure to make sure everything was straight, because that’s just not how I roll, I eyeball everything and it shows. 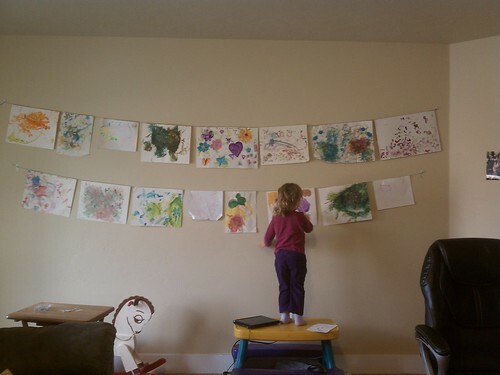 Lil loves being able to see her (and Daddy’s and Grandma ReRe’s) art. The pictures are held with large paperclips for now. I’m debating changing to clothes pins, but not sure. I’m afraid the clothes pins might distract. Thank you Stephanie. 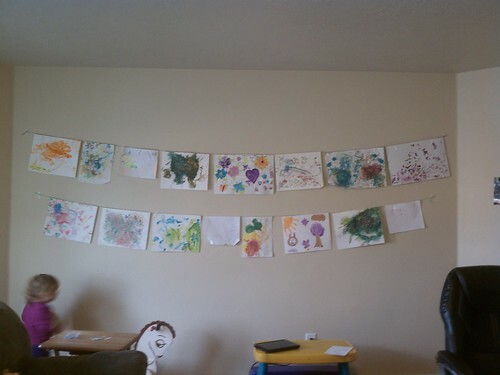 We love it and it’s really easy to change the art out since I just used paperclips. 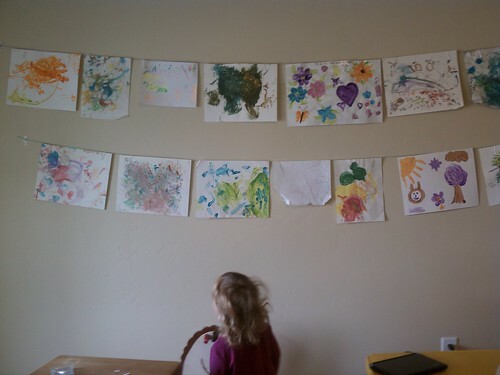 Lil loves seeing her art displayed on the wall for everyone to see.